Zhuhai Sanzao Airport is a moderately sized, modern airport that connects the area with many Chinese cities, but not many international destinations. It is located west of downtown in Doumen District. Budget carrier Spring Airlines flies here daily from Shanghai. 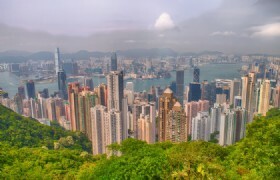 To reach Zhuhai from outside China, you could fly to Hong Kong, Macau, and Guangzhou all of which have large, modern airports with many international connections. 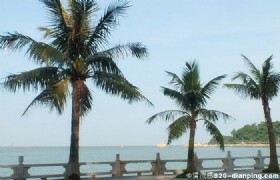 It takes only one hour or two to Zhuhai. From Guangzhou Baiyun International Airport, there is a frequent express bus service to Zhuhai, which costs RMB80 and about two hours and a half. From the Macau International Airport, it’s best to take the Express Link to Zhuhai. If you decide to go through the Macau immigration at the airport and take taxi to Zhuhai, the ride takes only about 15 minutes and costs about RMB60-80 for the short ride. From Hong Kong International Airport, there are three options for you to get to Zhuhai. First, you can choose to take the Airport Express to Kowloon Station. And then jump onto the free Airport Express transit bus K2 to the China-Hong Kong Ferry Terminal and take a ferry to Zhuhai. Second, catch a ferry from the HKIA Skypier to Macau and then cross into Zhuhai via the Gongbei border gate. Third, there are long-distance buses that go overland to Gongbei from HKIA. The journey takes 3.5 hours and costs HK$200. Chu Kong Passenger Transport operates a ferry service between Jiuzhou Port of Zhuhai, Hong Kong and Shekou, which is the Shenzhen ferry port. A service between Jiuzhou Port and Hong Kong International Airport for air passengers using the airport started on 10 July 2007. There are hundreds of buses coming from Guangzhou every day, usually via the Jingzhu (Beijing-Zhuhai) Highway. The trip will cost RMB70-75 and take about 2.5 hours. Buses leave every half hour and go to Gongbei. Zhuhai transportation by bus is perhaps the most convenient and value for money. There is no railway in Zhuhai and the nearest railway is in Guangzhou. However, there are many ticket offices located throughout Zhuhai selling tickets departing from Guangzhou.